Discover the new BaByliss PRO Volare X2 Clipper, with a Ferrari designed engine giving ultimate precision and maximum power to deliver the best cutting performance through any hair type. The Volare X2 Clipper is driven by revolutionary, ultra-efficient, high speed MaxLife PRO brushless engine technology that uses rare earth magnets instead of conventional carbon brushes to increase efficiency and reduce weight giving ultra-low vibrations and up to 10,000 hours use. Designed exclusively for BaByliss PRO, the X2 Volare Clipper has been built to an exceptionally high specification featuring a specially constructed blade cutting system that delivers an outstanding level of performance. Micro-serrated titanium coated blades cut twice as fast on the first pass through the hair giving exceptional precision with every cut. 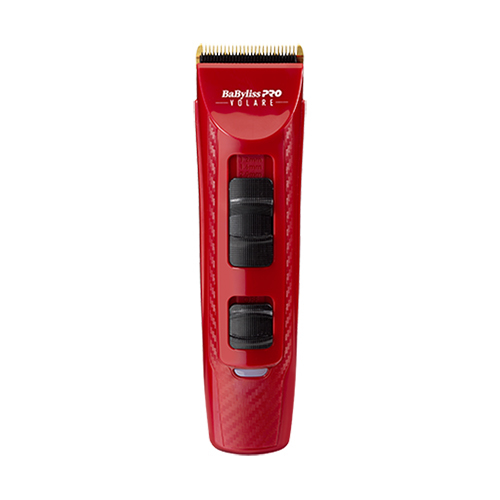 For added control, the clipper also features a 4 position taper option and the advanced lithium-ion battery gives sustained power performance, with 3 hours of constant cordless run time. Included with the clipper are 8 comb guide attachments and a display/ storage stand.